A blog dedicated to the thousands of bird species that fly, swim or walk on our planet. This species is endemic to the island of New guinea, being found along the central mountain range in both Indonesia and Papua-New Guinea. These birds are 22 cm long but behind each eye the males have a feather shaft that can reach 50 cm in length. 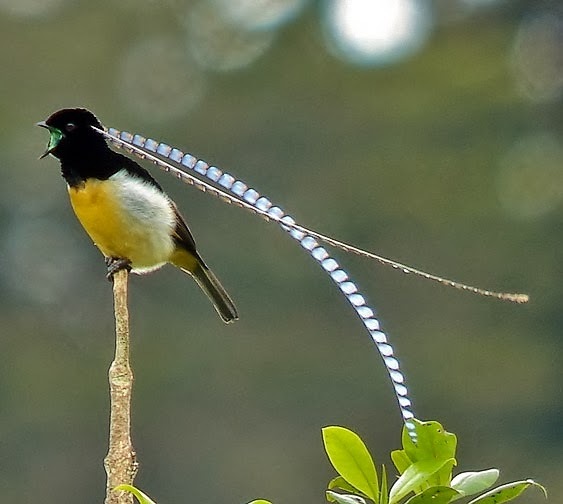 Males tend to be larger than females, weighing 80-95 g while females weigh 68-88 g.
The King of Saxony bird-of-paradise is only found in mountain rainforests, at altitudes of 1.500-2.850 m.
They are mainly frugivorous, usually favouring green fruits such as false figs. They are also known to eat insects. These birds breed in September-April. They are polygynous, with males displaying in a lek to attract females and having no further part in the breeding process after mating. The female builds the nest alone, where she lays a single egg that she incubates for 22 days. The chicks is fed by the female and fledge 20-30 days after hatching. They reach sexual maturity at 1-2 years of age. This species has a large breeding range and is reported to be widespread and common. The population is suspected to be in decline owing to ingoing hunting pressure, but it is not considered threatened at present.